On Saturday, October 13, Joan Roth and I set forth on an early morning schlep to Pennsylvania. This schlep felt like a mission, fueled by mutual purpose from different vantage points. She has had the strength to be in this fight for 50 years, and knows the constant struggle. But she couldn’t have imagined that she and I, as her 24-year old granddaughter, would have to fight the same way in what feels like a dystopian political climate. 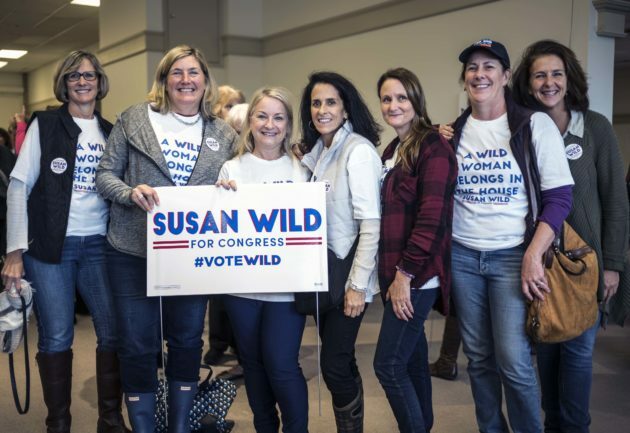 We arrived as two of many out-of-staters first in Bethlehem, then in Easton, and finally in Allentown—a city I’m familiar with from my years as a student at Muhlenberg College – for three canvass launches in support of Susan Wild. Wild is an outspoken community leader, attorney, and 60-year-old mother of two. 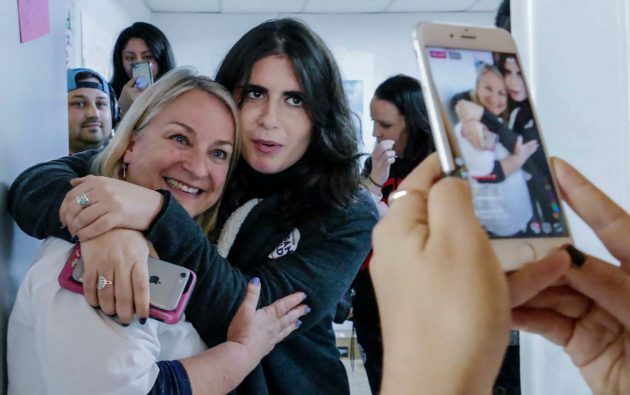 She is running for a seat in Pennsylvania’s newly redistricted 7th Congressional District, based around Allentown and the Lehigh Valley, which is currently Republican controlled. Endorsed by Emily’s List and NARAL, she won the Democratic primary over five male candidates and is the only woman to run in this district. The significance of this specific race is that it could singlehandedly determine whether or not the House of Representatives is flipped blue. Earlier this year, the Pennsylvania Supreme Court found that the state’s congressional district map constituted an illegal partisan gerrymander. The court instated a remedial map for this election cycle, but not without backlash – as this seat in congress is one of the most highly contested. In 2016, Hillary Clinton beat Donald Trump in this seat by only 1.1% because of party divides between counties that make up the district. 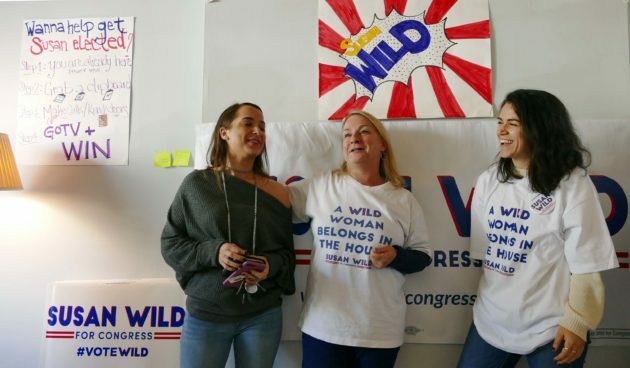 Having grown up in a military family and lived in the 7th District for over 30 years, Wild is touting an authentic connection to and understanding of the people and communities – including the Jewish community – that she aspires to represent. Meeting her, I found her undeniably tough, but also gregarious and approachable with a warm smile, a strong presence, and a relatable sense of humor. She loves to talk about of the joy she experiences spending time at her home garden with her dog. 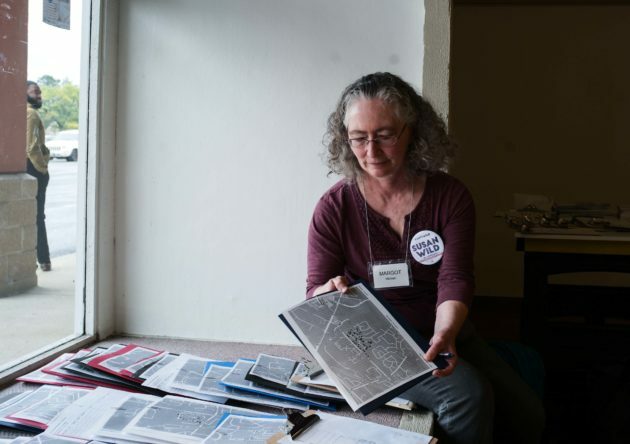 “The Torah teaches us to ‘love your neighbor as you love yourself.’ In Washington, we’ve seen a lot more ‘love yourself’ than ‘love your neighbor’ in recent years,” Susan Wild told us. “I’m seeking to change that. Jewish values such as Tikkun Olam inform my platform of protecting Social Security and Medicare, defending women’s reproductive choices, and working for equal opportunity for all. Wild is a groundbreaker who has dedicated her life in the public sphere. She was confirmed by the City Council as the first woman Solicitor of the City of Allentown, and if she wins by the modest margin that she is projected to win by as of now, she will become the Lehigh Valley’s first woman representative in Congress. At her canvassing launches, Wild confidently spoke across multiple intersecting issues: healthcare, education, job creation, minimum wage, climate change, social security, prison reform, access to safe and legal abortion and family planning, and restorative justice. “The environment used to be a bipartisan issue, all of a sudden it’s not. All of a sudden, people in Washington don’t care about what our streams and rivers and air look like,” Wild said. A vocal advocate for abortion rights, Wild is running against Marty Nothstein (R), also-Jewish, an anti-choicer who compares himself to Donald Trump. When asked about why she’s running, Wild responded: “What got me into this race in the first place is my children—my daughter is 22 and my son is 25. I am so worried about their generation, the generations to follow, and the country we are leaving behind for them. What keeps her fire fueled are the working families and the people who are struggling to pay their bills, their utilities, their healthcare, and who just feel like Washington has left them behind. 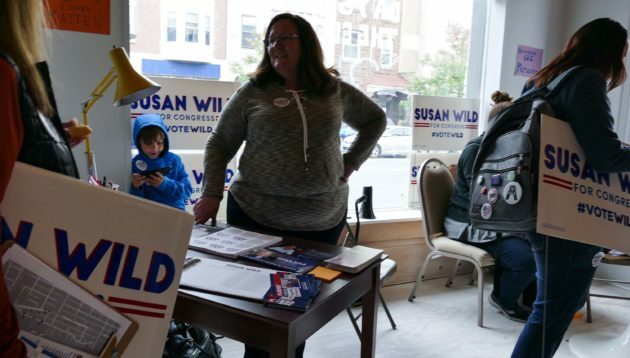 “I’m voting for Susan Wild because we’re in the worst political climate of my life. 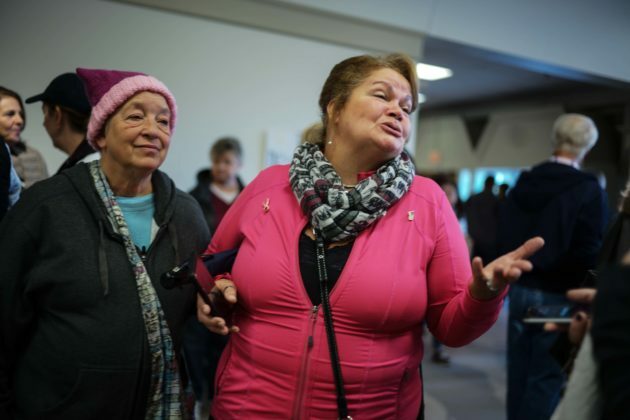 We are being priced out of our housing, the food is going up…everything is going up, except for my social security,” Valerie Chambers, a resident of Allentown Pennsylvania told me. Abbi Jacobson – co-creator and star of the hit Jewish feminist Comedy Central series Broad City who grew up in Pennsylvania– came to Allentown from Brooklyn to show support for Wild. 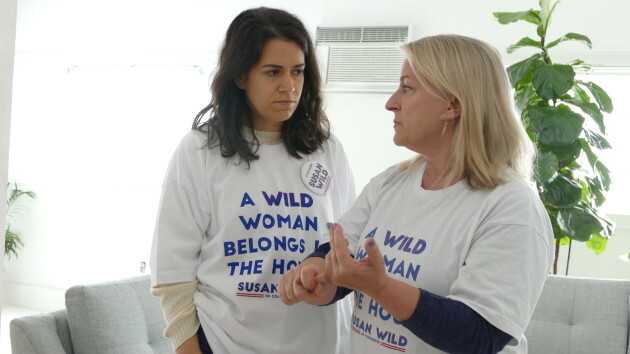 In their matching “A Wild Woman Belongs in the House” shirts, Jacobson and Wild discussed the importance of getting people under 30 years old out to vote. “We’ve had students out canvassing for us and it’s because they understand what the future looks like if we don’t elect a new wave of candidates, who frankly haven’t been politicians before. 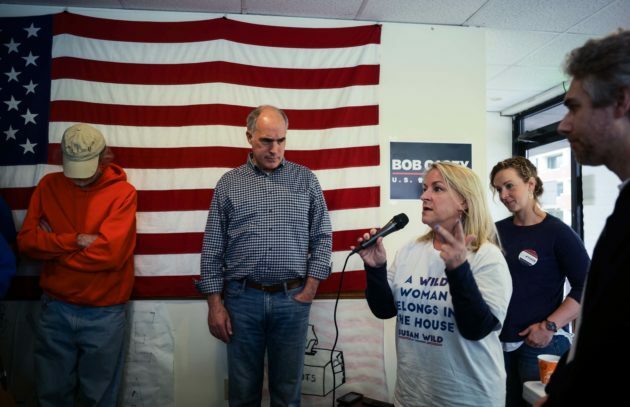 The people who are running this year are moms, people who have left their private jobs, and people who just desperately care about the future of our country,” said Wild. though there is a vehement push to get Americans under 30 to vote, a majority of young Americans feel hopeless or believe that they cannot affect what the government does. Or, they’re simply too busy to fully engage past an Instagram post.